We have set ambitious goals for the DC Water Works Program. First, for DC Water construction and service contracts, at least 51% of the total contractor workforce will be local residents. Please read the DC Water Works Program for complete details. 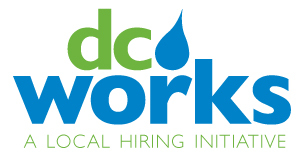 The majority of workers on DC Water's construction projects are hired and employed by construction contractors and their subcontractors, and there are many opportunities in a variety of trades. Current openings with these companies are now listed on our website along with the relevant contact information. Local residents can also learn more about current openings by calling 202-787-2304.